I love the raw images service provided by the Mars Science Laboratory teams. Inexplicable lumps of an alien world appearing like jigsaw pieces, just asking to be reassembled into something more understandable. 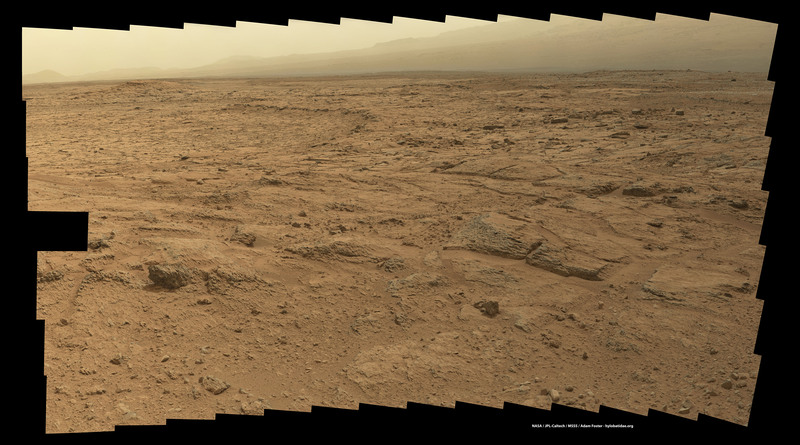 MSL Curiosity Sol 107 panorama of Glenelg (~7MB, 7k×3k JPEG) - the mission's geologists are effectively being set loose in a vast toyshop. For science! Computer-destroyingly-large version here. And to think people complained about the 2 megapixel cameras? The weirdly squishy-looking rocks to the centre-right, the angular broken blocks, the distant hills, the layered, eroded outcrop to the centre-left... Rocks! MSL Curiosity Sol 107, 109 panorama of Glenelg (~10MB, 10k×4k JPEG) - even more science. Blinking heck. Internet-destroyingly-large version here. today. Maybe even this week, although there was a pretty funny cat picture I saw last thursday. Seriously, though, my mind is pretty thoroughly blown at this point. I might want a wall-sized printout of this on my wall so I can stare at it and imagine I live on Mars. The automated password reset robot has sent you a completely randomly selected new password. At some point I'll get off my arse and write an *actual* password reset feature!